If you’re an environmentally-conscious business handling low volumes of waste, but you can’t justify the investment in a higher-capacity hydraulic baler, we might have just the machine for you. Or, if you already operate a cardboard waste baler, but need to run a small solution alongside for your plastic film, wrap of foil, you need look no further. 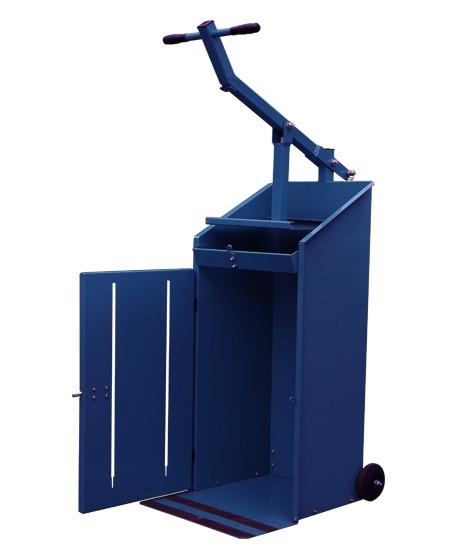 The RWM polypack is an extremely compact plastic baler that is also great for baling shredded paper. Requiring no power whatsoever, this two-handed lever-operated machine is easy to use, even simpler to maintain and is virtually unbreakable. In the modern business environment it is important that there are a number of waste baling solutions available, to suit companies of all shapes and sizes. That’s why the RWM polypack is such a great machine. It enables even the smallest of organisations to recycle their materials without breaking the bank. It can also sit neatly alongside a bigger cardboard baler, to handle the small amounts of plastic film, bags, wrap and foil that would otherwise be stored loosely or worse still entered into the general waste stream. This lever and spring technology is incredibly straightforward to operate and maintain, and because it has no hydraulic components, it requires no servicing and will not break down.